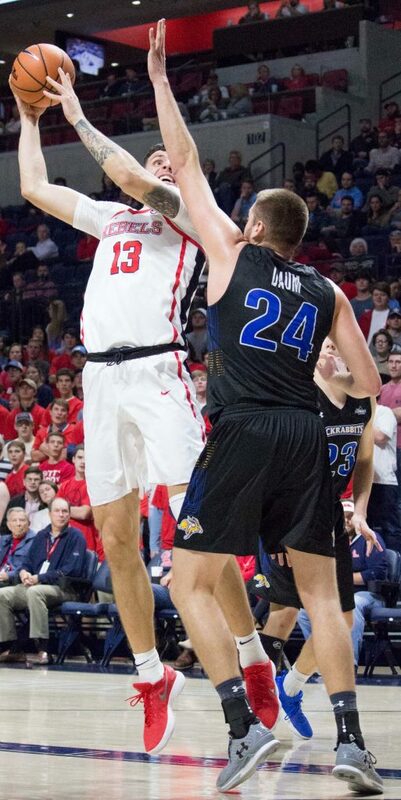 Despite a breakout performance from transfer center Dominik Olejniczak, the Rebels dropped their 10th game of the season to Texas on Saturday afternoon. The Longhorns, led by freshman phenom and potential future lottery pick Mohamed Bamba, turned the ball over just seven times as they picked up their 14th win of the season, this time courtesy of an 85-72 scoreline. After a red-hot start, the Rebels quickly regressed to the norm and allowed the Longhorns to control the second half and build a dominant lead. Deandre Burnett continued to display his scoring prowess, going 6-12 from the field and contributing 21 points, but three turnovers left much to be desired from the rest of his game. Olejniczak, who has battled with inconsistency and inefficiency this year, scored a season-high 16 points on the afternoon as he battled with Bamba in the post. But as the final whistle blew, the Rebels were left standing in familiar territory: another first-half lead, another second-half comeback and another loss. With March Madness approaching quickly, Ole Miss cannot afford to leave any points on the table. Following losses to unranked Texas A&M and Arkansas in the past weeks, the Rebels find themselves ranked 84th, according to the NCAA’s rating percentage index (RPI). The NCAA Men’s Division I Basketball Committee uses this metric, calculated from a team’s record and strength of schedule, to help select the 68 teams that make the tournament every year. And that does not bode well for the Rebels. After failing to qualify for the NCAA Tournament last year, Ole Miss assembled a deep run in the National Invitational Tournament, ultimately bowing out to Georgia Tech in the quarterfinal round. In fact, since Kennedy was hired to steer the ship in 2006, the Rebels have qualified for the “Big Dance” just twice, dropping out in the second round in both 2013 and 2015. For comparison, the Rebels ended those seasons ranked 45th and 58th in RPI, respectively. Clearly, Kennedy has his work cut out for him. Conference wins against Auburn and Tennessee, both of whom the Rebels face this week, could give fans in Oxford a thread of hope. Auburn, who beat LSU on Saturday 95-70, is currently ranked fifth in RPI, while Tennessee follows closely at 13th. Wins over highly ranked teams would certainly move the needle, but would they be enough to secure a tournament berth? Ole Miss’ 11-10 record is scattered with winnable losses; a dropped match to South Dakota State and overtime loss to Illinois State both stand out. As a perennial “bubble team” on the edge of selection, these results do not bode well with the selection committee. And sure, the Rebels dispatched Florida and Alabama earlier this year, but these wins simply will not be enough. Big wins are seen as flukes when disappointing losses are the norm. But such seems to be the story of Ole Miss basketball. Optimism does not survive for long in Oxford.